When you're a new blogger, one of the first challenges you'll face is deciding how you want your blog to look. If you're like me, you probably have no clue about coding and will pick one of the pre-designed templates offered for your blog platform. You'll probably add a few gadgets, put in some links, and if you're photo-savvy, add in a custom header and a pic or two in your sidebar. Sad, isn't it? It seems so barren not to mention the text was too small, the photos too small, and my homemade banner was looking a little, well, homemade. If you're curious what your blog looked like back in the day, check out this site. Keep it simple. Make it easy for your readers to find things like a Search bar to go through your past posts, or a Contact page. Visuals matter. Unless your blog is a writing blog, try to have an image in every single post. Even better, use your own original photography that won't be seen on any other blog. Here's some tips I learned about taking photos for my blog from the Style At Home crew. White is right. Use a lot of white space. Use large fonts that are easy to read. Differentiate between headings, text, quotes etc. by using different fonts or font colours. Be familiar. The majority of blogs will have the same basic foundation - blog header followed by a post and additional info in a sidebar. Readers like to know where things are. Don't be so unique with your blog design that you confuse people. Well directed. Well designed blogs are like a map - they direct you around the space. Important links are generally placed 'above the fold'. Do you want people to read a weekly series that you run? Put a button in the sidebar. Want to highlight your most popular posts? Have links in an easy to find spot. Do you have anything to add to the list? What features do you like in a blog? What are some of your favourite blog designs? My design is awful, haha. I've decided that it's a process though, and not something that's going to be fixed all at once and right away. Perhaps when I've been doing this for awhile (I'm only coming up on 1 year), I could fork over the money to get a redesign...but not right now. Blog Talk got me thinking about the design of my blog, which in turn got me playing around with fonts. It's always good to change things up every now and then so thanks. Wow! This is just great advice. I just started blogging about a month ago and I am still trying to figure everything out. I love your BlogTalk as it has provided me invaluable advice. I am so happy I stumbled upon your page! Thanks so much! I'm really proud of it, especially because that is out of my comfort zone. I know what I want things to look like, but doing it on the site? Hard. Great points. Blogger does give you the option to enlarge your photos but I find, especially with portrait photos, sometimes the photos still aren't as large as I'd like. Guess I'll have to figure that out. Regarding the domain name, I considered getting my own domain as well. But I have seen other blogs where they made a name change and they lost followers along the way because people didn't update their links in their RSS feed. As well, if someone lists your blog in their blog roll and their blog roll is organized in date order, you fall to the bottom of the list because they haven't updated their links. Then anyone clicking on the button would see all those BlogTalk posts. Hope that helps! Speaking of Making it Lovely, I took Nicole Balch's online Alt class this past Wednesday (growing a readership). She had some good design advice that I thought was pretty realistic. Namely, if you're not going to spend a lot of money to get someone to design your blog, keep it simple and clean. If you really want a well-designed, unique website, you're going to have to shell out some cash. Wait for that big upgrade until you have the money to do it right. I thought this made a lot of sense. Website design is hard (which is why people can command a lot of money for it). And while a lot of us might be great at DIY-ing stuff around the home, taking our I Can Do It attitude to web design - something we probably have little to no experience in doing - is likely a mistake. So keep it simple. So true. Blog design is one area I'm happy to bring in the pros for! I always appreciate your input Kathleen! You're right about waiting for a while before you do a redesign. Its easier to define your look and brand once you have a better idea of your content and what you want out of a blog design. I know what you mean. I didn't get a redesign until three years on! Your blog looks great. I really like your social media buttons. I think key are the search bar and an archive. If I find a new blog my first thing is to go through the archives. I also like blogs where posts have dates so I can see how recent they are. My photos were small at the beginning as well, but I think blogger has upgraded to allow for bigger photos? I find the most challenging regarding design is how blogs integrate ads, YHL I agree does a great job in keeping it clean, simple even with a lot of advertising. Some blogs look too busy with all the ads flashing and flipping and all! Jen, do you have a specific widget you use for the side bar buttons for a weekly series? Ditto Number 3 - especially in the body text. I've seen some websites use a new font for what seems like every single line of the body text, and it just ruins the readers experience. That's on par with Jen's pet peeve of automatic background music - they are both deal breakers for me, and probably outweigh even the best of content. I'm flattered to be included on this list! I have a few more tips to add if you don't mind? 1. You don't have to have a well-designed blog to START blogging. Focus on your content and "finding your voice" for a year while you get by on a clean template. Then maybe think about hiring (or recruiting) someone to help you with your blog design. And think of it this way - a lot of people might be reading your blog through an RSS reader anyway - so they won't even see your lovely (or embarrassing) design. 2. Photos go a long way! Use the FULL width of your post area (regardless of portrait / landscape images) and this will keep your posts looking sharp. And don't forget - you can use your phone with great filter apps (like Hipstagram) to take decent photos. 3. Typography! I won't read a blog that uses 20 different type styles, sizes and colors in their posts. Respect your reader! I just finished a major overhaul on my blog. It's scary to use a basic theme, and it took me two years to feel comfortable enough to go rogue. But I'm so pleased I did. I used Suffusion and was able to customize just about anything. I'm still tweaking here and there, but overall, I think my design is so much better. Great tips here! So true - my first design was awful! If I knew how I would change my design often, I get tired of things so easily! I loved your old look, we are always our worst critic! I loved getting mine redone but still have issues with the darn blue links that won't go away. Little things like that bug me! Great tips! Looking back on what my blog design looked like 3 years ago when I first started makes me cringe. Red background, tiny font...what was I thinking? Thank you for those words of advice :) I need to fill out my blog a little, it may be time for some professional help, lol! How funny... 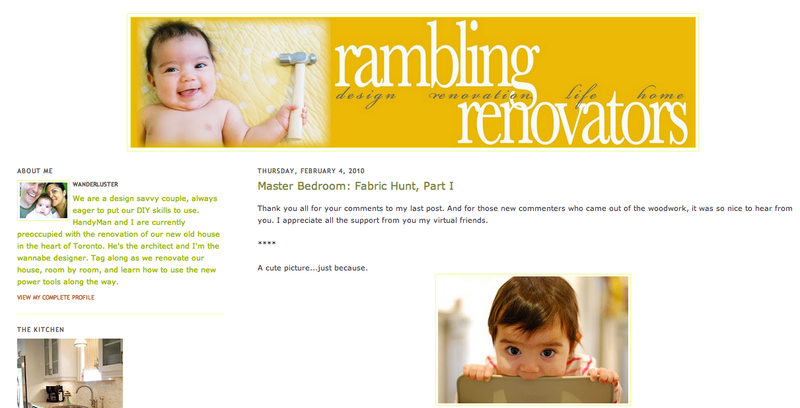 I am actually getting my blog redesigned and used yours as a template! : ) Might have to throw in some of your other suggestions as well, I love them all! Man, I remember that. Time passes too quickly! I force all my photos to be a certain width...it's a tiny bit of code I got off the Internet (don't recall where)...so my portrait photos have same width as my landscape photos...making my portrait view photos huge!!! Just thought I'd share! Having crisp margins along the sides of my photos make me happy! Oh and the change in photo size applies to all my images, old and new!